Home > Bahrain Drag Racing Championship > Ekanoo > Ekanoo Racing > News > World's first 7 seconds Porsche - EKanoo Racing 997 GT2 Porsche! World's first 7 seconds Porsche - EKanoo Racing 997 GT2 Porsche! Word just got wind fast that Ekanoo Racing 997 GT 2 became the first Porsche in the world to run a 7 seconds pass as the drag racing season 2017-2018 just kicked off in Bahrain Int'l Circuit. They ran a 7.956@305km/h make that a 190mph to the quarter mile strip! It was none other than Ekanoo's tops man Mohammed Zainalabedin behind the wheels of the ES Motor and Ekanoo Project car that has been tormenting drag import news! Finally after two years of handwork and bad luck,my drag 997 GT 2 became the first Porsche to run 7 seconds in the world. Big thanks to the ES Motor and our team for their continuous R&D and support- contented Ekanoo took to social media after the pass. One of the future Porsche cars to look for in the solid 7 seconds in the next few months would definitely be this 'grey' beast with fully customized sequential gearbox and magnus motorsport clutch valve. Again, ES Motors are involved with Ekanoo Racing running Syvec electronics in the GT2 ECU. 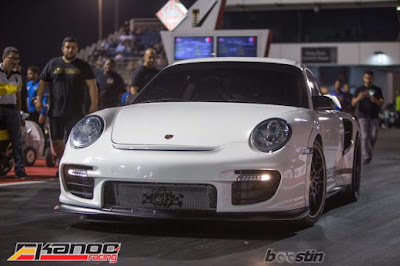 Early in the year,Ekanoo Racing ES2XXX 997 GT2 was officially world's fastest and quickest Porsche to the 1/4 mile when they 8.00@303km/h(188mph) at Bahrain International Circuit.Tuned by Emre Levent using Syvecs ECU 4.0li motor built by Ekanoo and Esmotor in Bahrain. Here is the video when they went 194mph in a roll race at Bahrain Int'l Circuit.